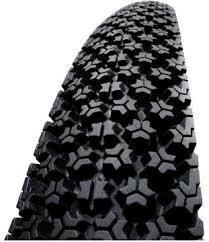 Excellent puncture resistance due to a high-density nylon fabric ply under the tread. The truly novel design of the "star" tread pattern offers exceptional grip and adherence on slippery surfaces of all types, whether damp, very wet, snow-covered or greasy. The "Star Tread" pattern (patented by MICHELIN) offers increase tread block mobility as well as localised pressurisation to maximise grip.